Similar to Anthony Bourdain's The Layover, this page shares what a traveller can do, eat, visit and enjoy within 36hrs in Hangzhou, China. Due to our heavy schedule, my friend and I usually go for weekend trips to unwind and rejuvenate before heading back to work the next day. On this page, we share our 36hrs weekend trip to Hangzhou. 0100hrs - Taking the night flight, we arrived Hangzhou at 0100hrs (Saturday) and headed straight to the hotel near the famous West Lake - Orange Hotel West Lake. The registration was quick and very soon we were resting in the room. Our room was upgraded to a suite which had a living area. It was nice and cosy place. 1100hrs - We had our first meal at Hangzhou in a nice restaurant - Promising (锦香来) located right outside the Hangzhou aquarium. The restaurant was quite nicely decorated. We were ushered to a table near the window where we could see the street view. 1200hrs - After the scrumptious meal, we started our journey to explore the West Lake. 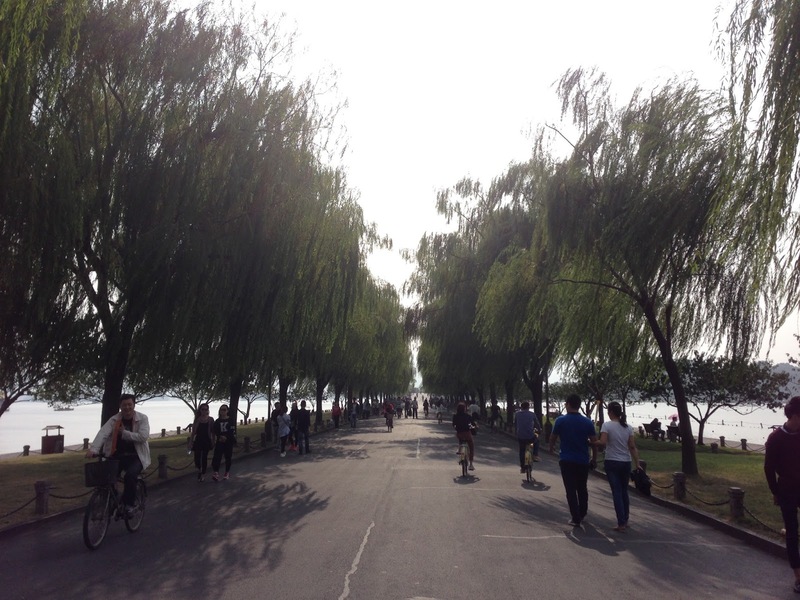 We walked along the entire West Lake (12km), which took us about 4-5hours. At three-quarters of the trip, we were already exhausted and hungry. 1800hrs - We found a nice cosy place along yanggongdi road (杨公堤) to rest our tired feet and sate our hunger. We ordered their local dishes, particularly the Dongpo Pork Belly (东坡焖肉). 1900hrs - It was almost 7pm and we were burned out. We walked back to the Hotel and rested till morning. 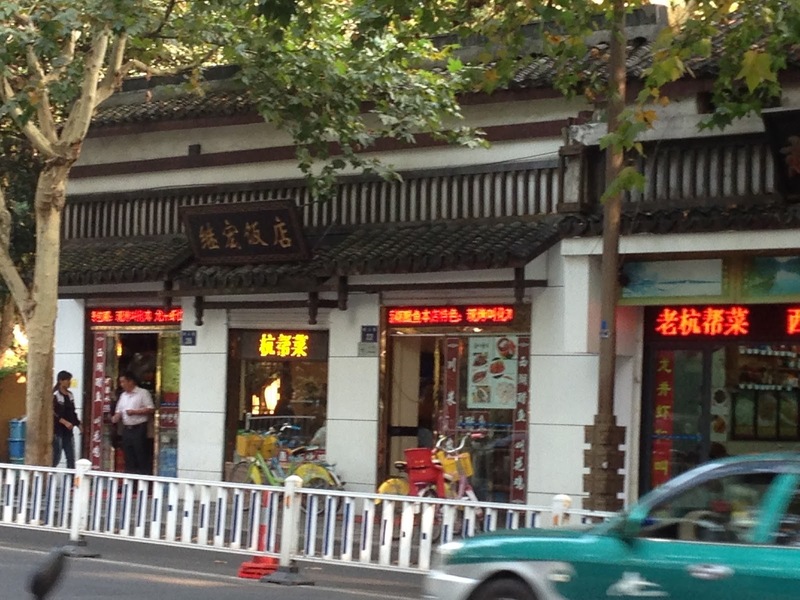 There are many food streets in Hangzhou, similar to Taiwan. At Hefang Pedestrian Street (河坊街), you will get to eat many local specialties from Hangzhou. For instance, snacks, tea, food and many more. 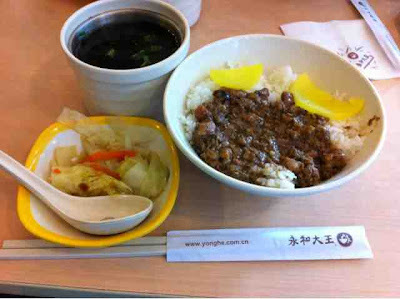 Yong He Da Wang Braised Minced Meat over Rice (永和大王卤肉饭) has a chain in Hangzhou. Originated from Taiwan, the chain restaurant is popular for its braised minced meat over rice and soy bean milk. 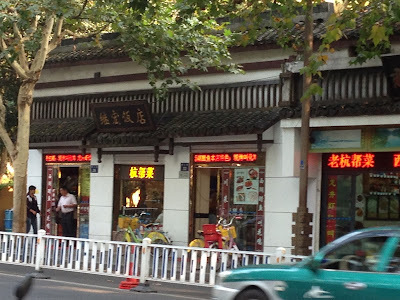 Located at the entrance of Hefang Pedestrian Street, you can try Taiwanese food in Hangzhou. Yang Tang Fan Dian (羊汤饭店) is a restaurant selling a variety of lamb dishes from dumplings to noodles, etc. I was overwhelmed with too much lamb meat. Having three lamb dishes, I have reached my maximum threshold. But the dishes were rather delicious.